I am always drawn to black and white baby photos. Probably because I am less distracted by the colour and can just see the baby for what it is. A perfect little newborn. 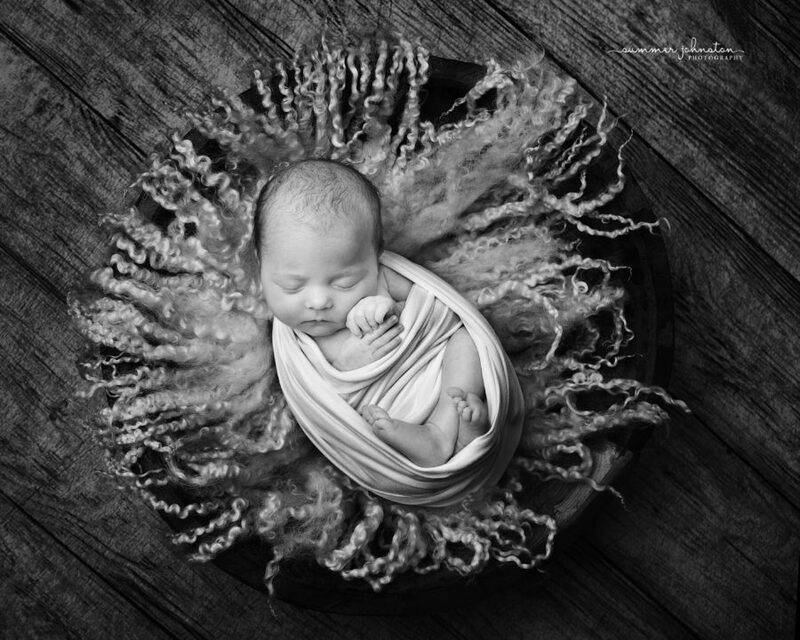 During each newborn shoot, I like to ensure I capture a number of photographs with baby in set-ups that lend themselves to being edited in black and white. I want to provide Rawtenstall mums with beautiful timeless photographs of their babies that they will proudly display in their homes for many, many years to come. 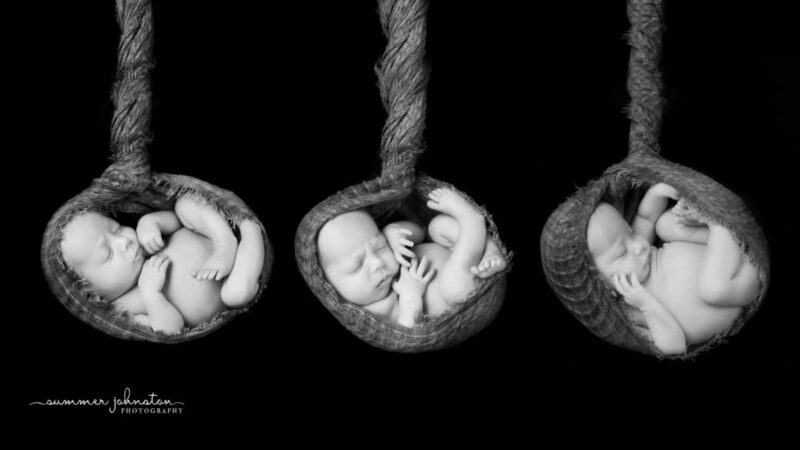 The same three babies are pictured below – this image is shot separately and edited in post processing to make it look like the three babies were photographed at the same time. Please note, babies are lying down on a beanbag for this image, and not suspended in the air. Capturing those precious early moments of your baby is one of the greatest and most beautiful parts of being a professional photographer. Creating exquisite, timeless portraits that a parent can cherish forever is a pure delight. Photos like these will look stunning printed large and displayed in your home. They are completely timeless. Newborn babies are so unique, even when they combine threes! Yet everything about them is perfect and I love to plan each session individually so that each client receives something a little bit different. For the triplets photo shoot, I wanted to try and capture all three of them together as much as possible. I chose to use a lovely flokati rug from one of my favourite suppliers Dutch Style who source the most amazing products. The wrap in the photo where the babies look like they are suspended I knitted wrap from Cherry Blossom Props. I like to get parents involved as much as possible during the session and I love these darker shots (below). Chloe was sat on mum’s knee here, cradled in her hands, when she gave me a huge yawn. Its wonderful to capture moments like these. Categories: Maternity, Newborn and Sitters. Tags: maternity photography, newborn photography, sitters photography and sitters photography;newborn photography; maternity photography; baby photography; newborn baby photography. 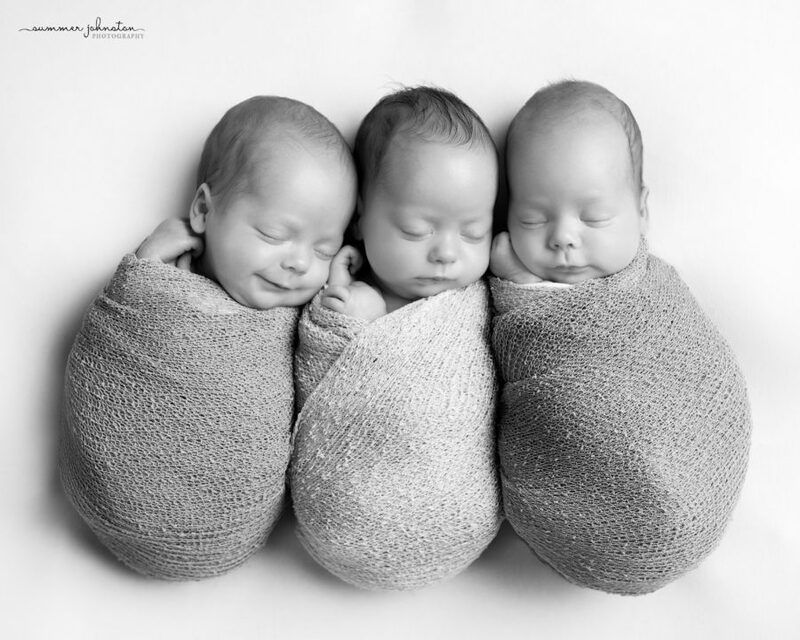 Prominent words: babies, baby, baby photos, black, black and white, boys, capture, edited, look, love, newborn, newborn photography, perfect, photographs, photos, session, shoot, timeless, triplets and white. Want to keep up to date with all the latest information and offers? Join our tribe to be the first to receive special promotions! Not interested? just close the window by clicking the cross in the top right corner.